At Truth For Life, our mission is teach the Bible with clarity and relevance so that unbelievers will be converted, believers will be established and local churches will be strengthened. As part of this mission, we continue to look for opportunities to assist our listeners as they study the Bible. 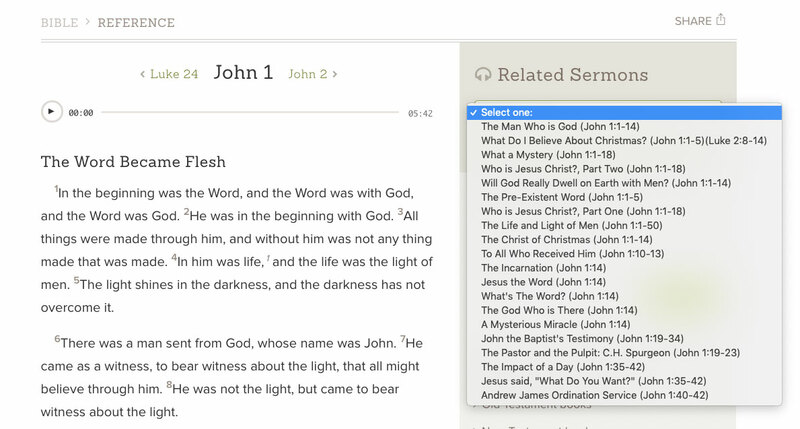 We are pleased to introduce a new feature in the Bible section of our website. When looking up verses, you will now see corresponding sermons from Alistair Begg listed in a drop down menu at the top of the page. After reading the verses, you can select a message and listen to a sermon from Alistair Begg. This feature is also visible in the side menu in the Bible section. If a sermon is not available, the Related Sermons feature will not show up. We hope that this enriches your Bible study. You can find all of Alistair Begg's sermons in the Resource Center and sort by topics, scripture and date. All sermons are available to download for free.